The Mint of Austria has unveiled their latest coin in the series, “Austria by its Children”. This charming series began three years ago and has given Austrian 9- and 10-year-olds the opportunity to depict something important to them about their home town or province. The series, which includes two coin issues per year, has been well received both in and out of Austria. 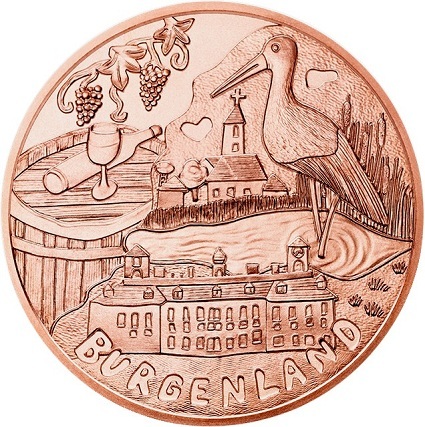 The new coin is the eighth release overall in the series and the second of 2015; it features the province of Burgenland, Austria’s most eastern administrative region. Burgenland bills itself as “the sunny side of Austria” and is best known for its agriculture, the National Park of Lake Neusiedl, its numerous spas, and, of course, lots of wine. Lake Neusiedl is an excellent location for water sports, including surfing, kayaking, and sailing. There are 240 species of birds who call the lake their home. It is 36 kilometers or 22 miles long and up to 14 kilometers or 8.5 miles wide. The lake is not deep, however, measuring only about 1 meter or 3.3 feet deep on average. The region has numerous hot springs and the spa industry has blossomed. As the region enjoys some 300 days of annual sunshine, Burgenland has the highest average temperature year round in Austria. The sun and soil are ideal for the many vineyards of the region, which produce good wine for well-known and sought after labels. The region offers all the elements for a perfect relaxing holiday; you can wake up to sunshine, undertake some water sports, go for a run in the countryside, and finish your day with some good food and excellent wine. 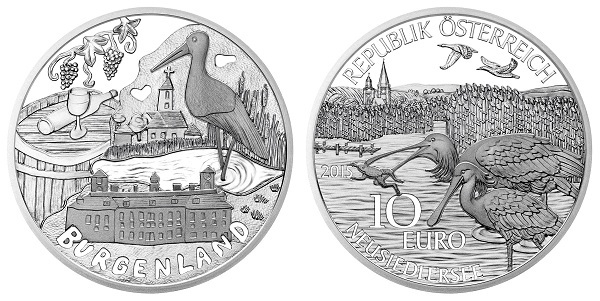 The coin’s reverse includes the winning design submitted by Leonie Schrollenberger. The Mint of Austria’s Master Engraver Thomas Pesendorfer set forth to adapt the design to accommodate areas of texture and bright color, while working to achieve an appropriate relief to the coin. For example, the blue sky of her original drawing becomes texture as seen behind the stork on the right side of the coin’s reverse. The stork is, of course, standing in Lake Neusiedl. Leonie also included a charming depiction of the castle of Esterhazy in the foreground, and a village centered around a church steeple in the central field. In the upper left area of the design she has included two bunches of grapes on a vine, a wine glass and bottle, and a wooden wine cask. The obverse of the coin was designed and engraved by Austrian Mint engraver Helmut Andexlinger. It features the UNESCO World Heritage Site of Lake Neusiedl and some of its many resident migratory birds, including pelicans (one holding a frog in its bill) and ducks. The shores depict the abundant reed beds, an important natural habitat for the region’s wildlife. A dock is located in the left area of the design as well as two church steeples located in the regional town of Rust. The obverse of the coin also features the country of issue, REPUBLIK OESTERREICH (Republic of Austria), the year of issue, 2015, the face value of 10 euros, and the name of the province of BURGENLAND in a stylized text. Released on October 7, the silver coin is available in two qualities: Proof and Special Uncirculated. The Proof coins are encapsulated in a presentation case with a numbered certificate of authenticity. The certificate includes all the technical details as well as background information on the series. The special Uncirculated coins are available in a blister pack with a Vienna-themed design on the sleeve. 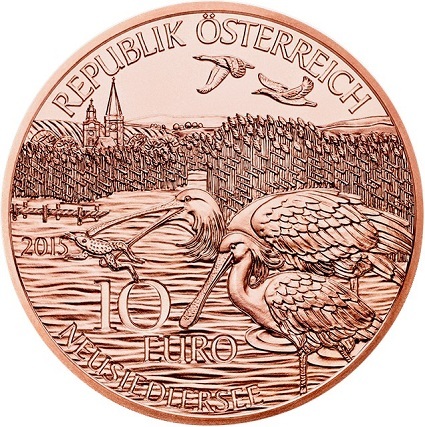 A copper version will also be available in Austria in circulation quality. The copper coins have a reeded edge, whereas the silver coins have a smooth edge. For more information on this and other coins on offer from the Mint of Austria, please visit their Web site. Information is offered in English and German, with international orders dispatched where applicable.